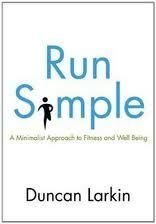 In his recent book, Run Simple: A Minimalist Approach to Fitness and Well-Being, Marathon & Beyond author Duncan Larkin talks about the mental aspects of running. We all play “head games” with ourselves, but Larkin maintains that all you really need is the right attitude. Here’s what he has to say about “head games”: “Running is almost entirely a mental affair. You have to learn to believe in yourself and in your goals. You have to make peace with the fact that you won’t always “fire on all cylinders” every day, and that a bad run here or there isn’t going to prevent you from ultimately realizing success. Sometimes you can’t follow an exact plan because life gets in the way. Don’t quit! Just put one foot in front of the other and don’t take all your life’s worries out on the roads with you. If you do, leave them there when you return. “Running should be fun! It’ shouldn’t be one more thing to stress and fret about. ‘Head games’ can sometimes be good; however, I use head games to convince myself to finish a tough workout. For example, I tell myself that if I complete the workout to standard, I will treat myself to something afterwards. Or I will convince myself to just focus on “one lap at a time” during a difficult set of track repeats. The key is to take all your mental effort and make it positive. Don’t waste any mental energy on doubt, frustration, and despair. Running isn’t always easy, but it should always be enjoyable and rewarding.” For more information about Duncan Larkin, click here to visit his website.